It all started with Norbert Ernst, German IT specialist specializing in industrial control systems. Nice kinda resumé, a bit too serious and not that fancy … Yet, by starting Astera in 2007, a real changeover did take place. He hired Simon Canins, Munich guy like himself, whose status as “Entwicklungsingenieur” (that’s “Development Engineer” for you reader not familiar with German) lead him directly heading the R & D dept. Their new guideline was to bring innovation into the world of compact wireless projectors, from control system to installation accessories, their motto being quality and ergonomics. The “Wundertechnologie” (Tech Wonder to your ears) now operates. 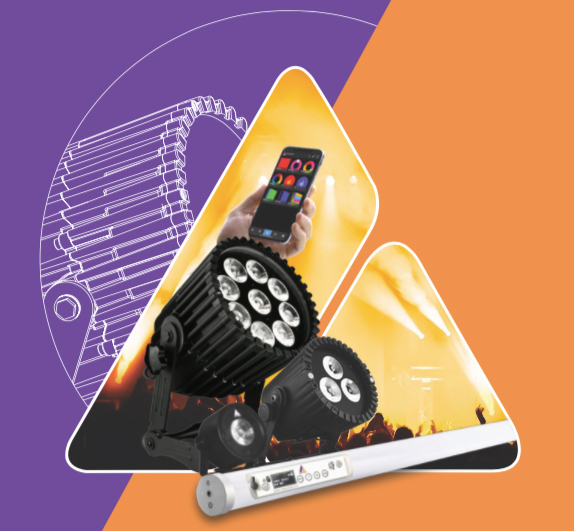 Some components later, including Cree and Philips LumiLED® leds, LG Chem batteries, Neutrik connectors and Lumen Radio CRMX® modules, their TitanTube lighting system becomes a reference for the television and photography film industry. The AsteraBox CMRX, or ART7, is a pocket Control Tower. 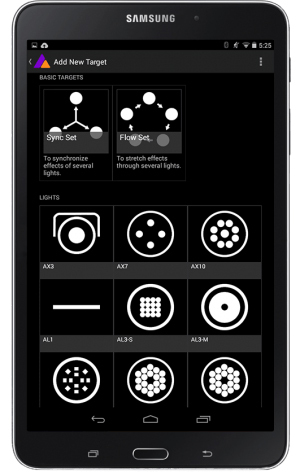 This is the cableless versatile interface between lighting programming devices and Astera projectors. 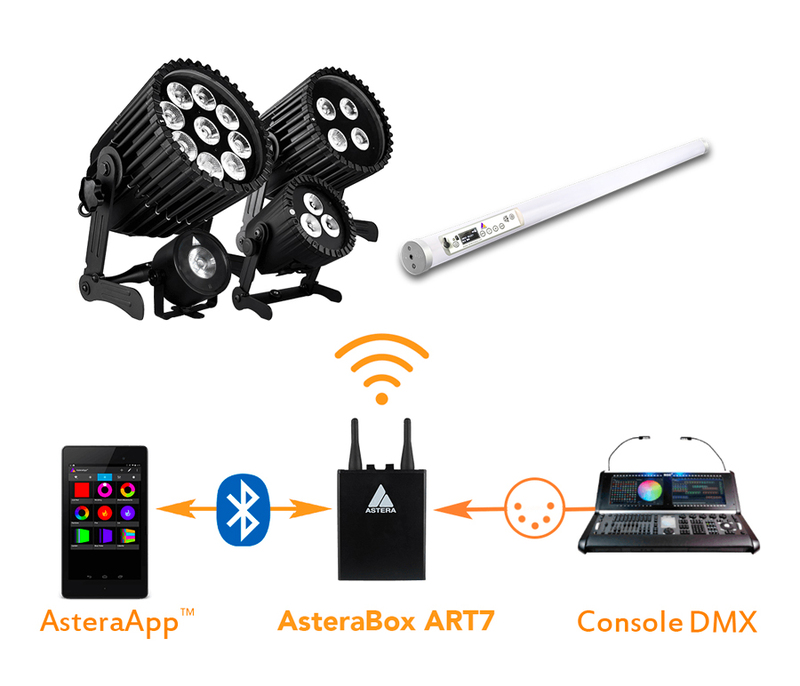 The operating scheme is based on the AsteraBox wireless box, the AsteraApp application (or a lighting console), and one of the many projectors in the Astera range. The heart of the system is, as with any technological evolution, communication. The spirit of it all lies in the global and total ergonomics of the various elements. Physically, it is the size of an intercom pocket box, with led indicators, dual diversity antennas and grip belt included. Its USB charger, its autonomy of 20 hours, its resistance to shocks and humidity ensure long days of work without flinching, hanging on the hip of an electro or the Best Boy. 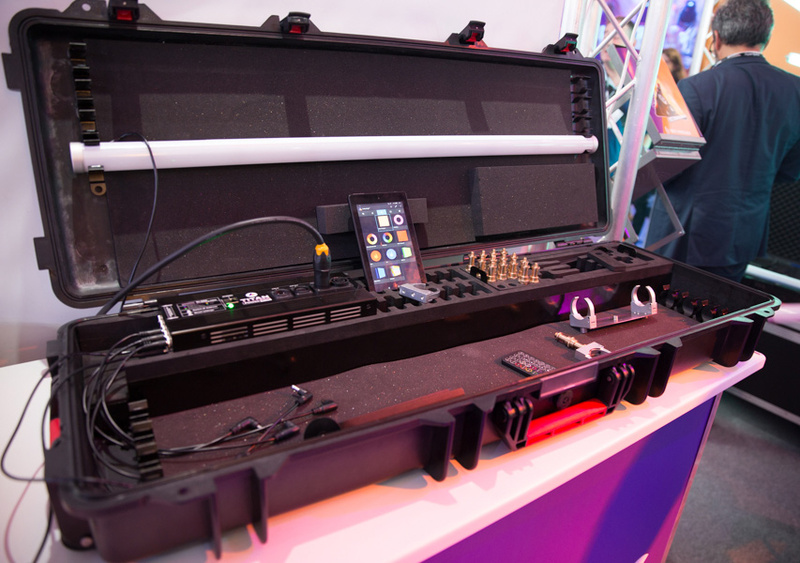 The AsteraBox can receive information in many ways : in DMX512, via its mini-jack DMX adapter, by the infrared ARC1 Astera small remote control, or by Bluetooth. This last connection will be privileged to have directly on his device Google or Apple the application AsteraApp. It can manage projectors remotely, view their status or quickly program a large number of light effects, using then the integrated RF function (868 MHz in Europe). All its information transmitted to the projectors by the ART7. 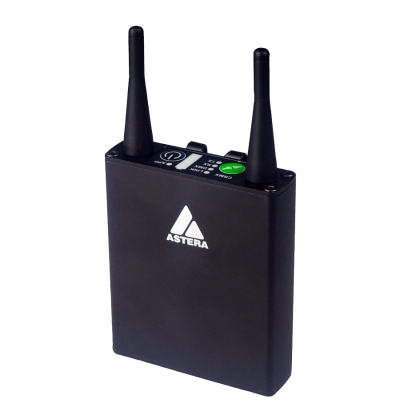 The same AsteraBox can also be used as a CRMX® transmitter, the LumenRadio DMX wireless standard, a guarantee of quality. The same system is nevertheless open to the second largest specialist in wireless distribution, Wireless Solution, the majority of Astera projectors supporting both protocols (CRMX® or W-DMX®). Each of these projectors are designed around a bright LED source, a battery of great autonomy, a very professional DMX wireless receiver, a comprehensive collection of bi-directional control tricks, all combined in a compact and waterproof casing. This is already the case for AX3, AX5, AX7 and AX10 led PAR, all waterproof, battery-powered, and wireless, with power consumption respectively of 15, 45, 60 and 135 Watts. AX1 and AX3 are in RGBW, AX5 and AX10 in RGBWA (and better CRI). All these models can also be controlled thru the same aforementioned infrared IRC1 remote control. This one, another useful trick, can also be used to point at some of the fixtures you want to add to this or that group of fixtures when selecting them while in addressing or pairing mode ; very handy when all the gril is already up and running, and avoiding the usual “press the on/off button to select this fixture” routine. The story goes on with the two screen stars of Astera, PixelTube autonomous lighting tubes and TitanTube, acclaimed by many directors of photography worldwide. The AX1 PixelTube has become a reference since its PLSN Goldstar Award received at the LDI of 2017, rewarding a crazy year of innovation for this little light stick. Awarded in turn in 2018, both at Plasa and LDI, the Titan Tube is the ultimate evolution of the LED tube for cinema, at least until next year, you never know with LED technology! 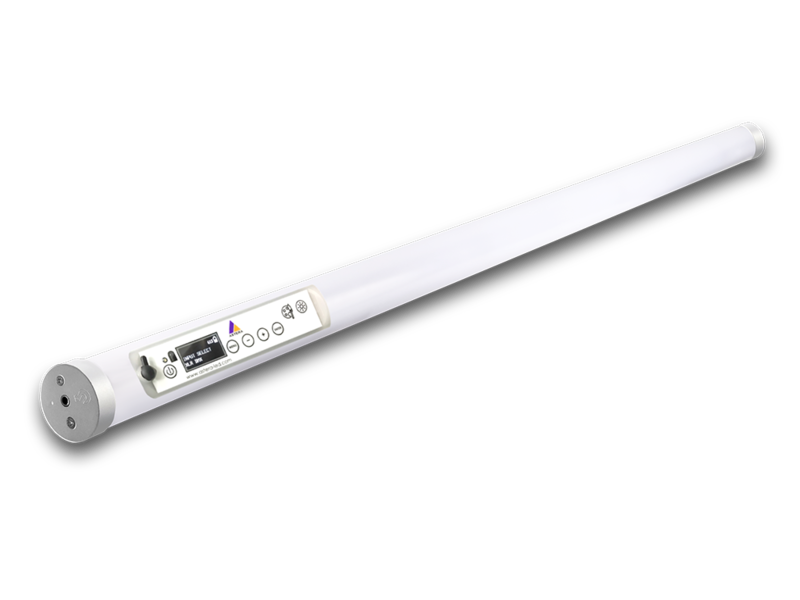 This 2018 version consists of a lighting bar entirely designed for filming. 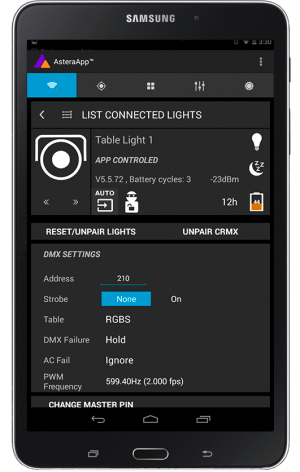 Keeping the principle of DMX wireless up to 300 meters, he now accepts other protocols, whether by infrared remote control ARC1, wireless CRMX®, and great news wired DMX connection or on the tube itself in manual mode, thanks to its built-in LCD display. 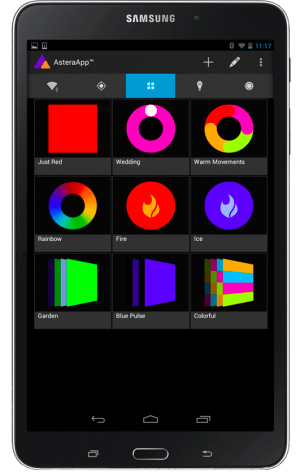 With its integrated menu the user can directly access the color, hue, saturation and intensity (HSI control) settings. The Titan Tube is recognisable by its setting menu and display on the back, unlike the PixelTube whose control is exclusively wireless. Its polycarbonate construction and metal end caps now contain 16 pentachromic LED sources, with a 180° illumination field and a color temperature to choose from 1,750K to 20,000K. The special color mixing of red/green/blue/mint/amber LEDs allows an impressive maximum of 2,900 lumens, with 96+ TLCi and CRI, despite a power consumption of 72 Watts only. For short amount of time (2 hours during actual takes on a set, which is sound enough), the output can even be boosted by a ratio of three. IP65 waterproof by nature, like the rest of the Astera range, the Titan Tube is powered by a Lithium-ion rechargeable battery. This allows up to 20 hours of working time for only 3 hour recharge time, while keeping up to a lightweight 1.35 kg. The more you’ll use Titan Tubes on a single operation, the more you’ll need the new Charging Case, complete with all accessories (hooks, spiggots, and so on), and an interesting way of displaying the tubes inside the case, as you’ll get a global all-at-once view of all the display menus in a glance. 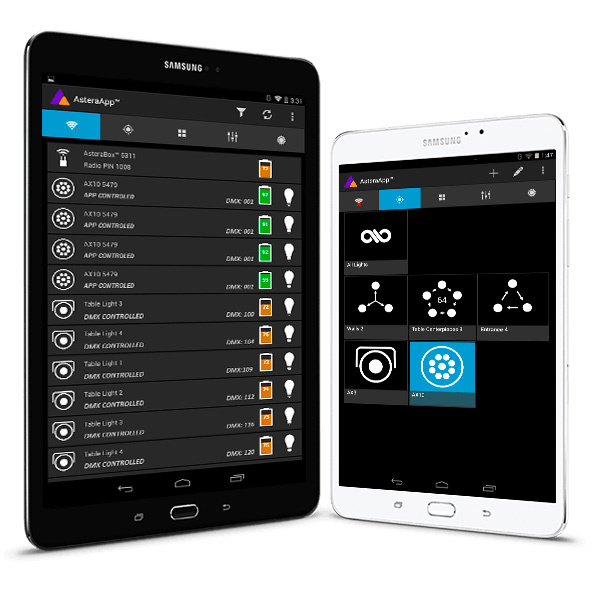 Integral part of the whole Astera ecosystem, and totally essential for all Best Boys and techies to always keep in-hand control, the Astera App software allows quick and easy programming and addressing of all Astera models (only) once linked to an AsteraBox. Several links can be achieved on the same set or in the same place, and a Pin code will lock to your very own device, and not the colleague’s present on the same site. 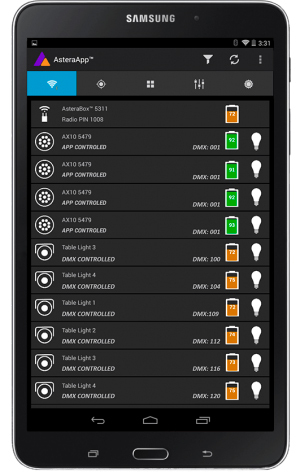 Real-time status (including battery level and DMX settings) of all Astera projectors linked to the AsteraBox. Remote addressing and settings of Astera projectors, with “Highlite” quick recognition function. Sync or grouping of projectors, by sets or by chasing sets. Many lighting programs (fixed or chasing) on several pages, configurable and named at will. Text and photos : Tristan Szylobryt. Translation : Bruno P. Souchaud. This entry was posted in Home-News, Reports by admin. Bookmark the permalink.